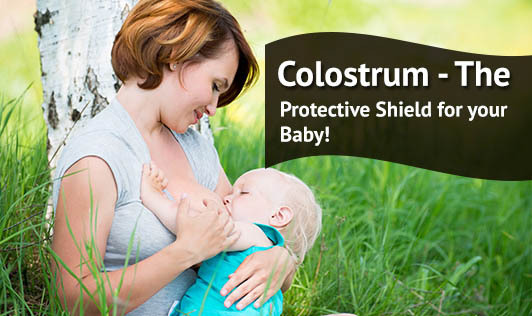 Colostrum - The Protective Shield for your Baby! Breast milk which is produced in the first few days after delivery is called ‘Colostrum'. It is thick and yellowish in colour. As the days pass by, breast milk becomes white in colour. It contains complete nutrition for the baby. Colostrum is very rich in proteins, vitamin A and sodium chloride. Colostrum contains antibodies, white blood cells, growth factors, anti microbial factors and other anti inflammatory proteins. This forms the first immunization vaccine for the baby. It also has a mild laxative effect, helping the baby to pass stools easily. This helps in clearing the excess bilirubin as well as preventing jaundice. Make sure your baby gets a lot of Colostrum to give him his dose of immunity for his entire lifetime!